We are proud to be an independent, local Houston business. 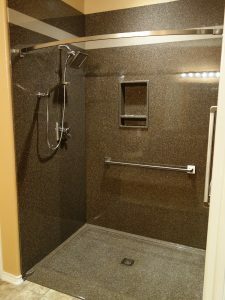 For bathtub and shower remodels, we offer homeowners in the Greater Houston area a selection of five distinct lines of shower materials, including composites, natural stone, solid surface, and tile. Kohler’s Choreograph is a collection of stunning, stone-resin composite shower walls that offer a unique look and feel for the bathing area. The panels are highly customizable, available in many different colors and styles, and feature a joint system that allows for faster installation and reduced maintenance. Choreograph is made from Kohler’s exclusive Serica material, which is GREENGUARD-certified for low chemical emissions. Choreograph systems can be accessorized with matching shower components such as storage shelves and teak trays, and combined a low-profile shower base for a sleek, finished look that will never go out of style. This high-end product is also easy to clean and appropriate for both guest baths and master baths in almost any home. Choreograph products are Made in the USA and have a 10-year residential warranty. To learn more about the Kohler Choreograph shower wall and accessory collection, visit Kohler.com/Choreograph. 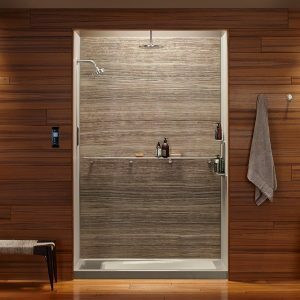 For a truly upscale look that combines the unmatched beauty of real natural stone with an easy-to-clean, waterproof panel, we offer our exclusive thin stone shower systems. Our thin stone slabs, soap dishes, and accessories are available in a variety of natural stone types and can be integrated with almost any style or color scheme. 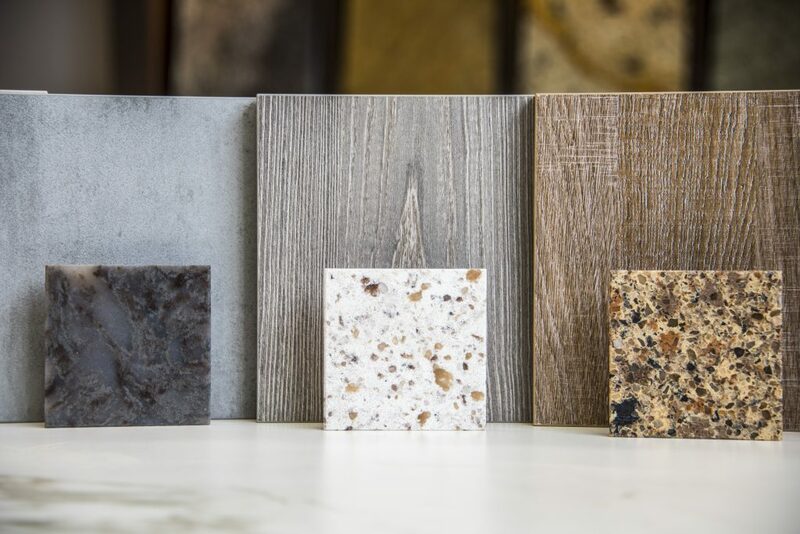 They are ideal for shower and tub surrounds, accent panels, feature walls, and tub decks, and can be coordinated with matching stone shower bases, vanity tops, floor tiles, mosaics, and pencil trim. We also offer translucent versions of these products which can be backlit with LED lights. Natural stone shower walls are a groutless solution that will last forever, without requiring frequent maintenance. There are very few other bathroom remodelers in Houston, the Woodlands, or Sugar Land with the expertise to properly install this kind of product. For homeowners who are looking to achieve a great price point on a shower or tub remodel, but want a durable product that’s unlike anything in the box stores, Sentrel is the ticket. These high-resolution composite shower panels deliver the appearance of stone, but without the high cost and more involved installation of stone slabs. As with all our tub and shower solutions, we always install these systems from scratch, with brand new waterproof backing, after your old tub or shower walls are completely removed to the studs – we never, ever wrap anything over top of your existing tile or cultured marble. Sentrel is very easy to keep clean and comes in 21 distinct finishes, all of which include a lifetime guarantee and are 100% Made in the USA. Check out Sentrel at www.sentrelproducts.com. We are Houston’s exclusive Sentrel dealer, and this product is one of our fastest-turnaround solutions for a low-maintenance tub or shower remodel. Onyx is a versatile solid-surface material that is ideal for a variety of situations. It is especially popular with homeowners who want to cut down on the maintenance associated with tile, and is also suitable for nicer hotels and even apartment complexes. The density of Onyx is consistent throughout the product, a feature which eliminates the warpage and curling common with aging cultured marble. Onyx is a unique, proprietary material and is NOT a cultured marble product. The Onyx Collection offers custom-made shower bases, wall surrounds, vanity tops, and tub decks that are known for their attractive appearance, durability, and ease of cleaning. 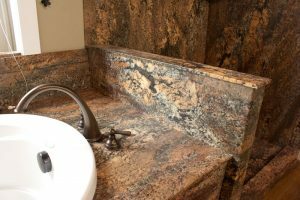 We install complete and partial systems in Onyx, including both bases and walls, and we also offer coordinating Onyx countertops for vanities. Onyx bases, which are sturdy and non-slip, are often combined with other wall surround materials such as tile, Choreograph, Sentrel, or natural stone, and they blend well with all four. We can even install a tile inlay within an Onyx wall system. See our Gallery section for many examples of what can be done with Onyx Collection products. There are over 60 total colors available. Onyx Collection products are both guaranteed for life and 100% Made in the USA. See more at www.OnyxCollection.com. Far and away, the most customizable and varied option for your shower or bath is tile. We work with stone, glass, metal, terrazzo, porcelain, and ceramic tile, so anything you can dream up, or anything you’ve seen in a magazine or online, can be built to your specifications. When properly designed and installed, custom tile work should last as long as the home. The limitations of tile are that it requires greater effort and planning in the design phase, additional time and expense to install correctly, and more frequent maintenance than slab or panel systems over the long run. With tile, it is very important that the installer follow TCNA (Tile Council of North America) guidelines to ensure that the installation is completed according to industry best practices regarding waterproofing, layout, thinset coverage, grouting, and sealing. Unfortunately, most tile installers do not educate themselves in this regard. As a result, there is wide variability in the quality of tile installations, and many horror stories about leaky tile showers. The fact is that properly-installed tile should not leak. Period! Since tile and grout are not waterproof, these issues ultimately boil down to the type and quality of waterproofing that is installed. At Simplicity, we use Schluter KERDI products to achieve our watertight, leak-free shower systems, and we are proud to be an Authorized Schluter Dealer. See more at www.schlutersystems.com. 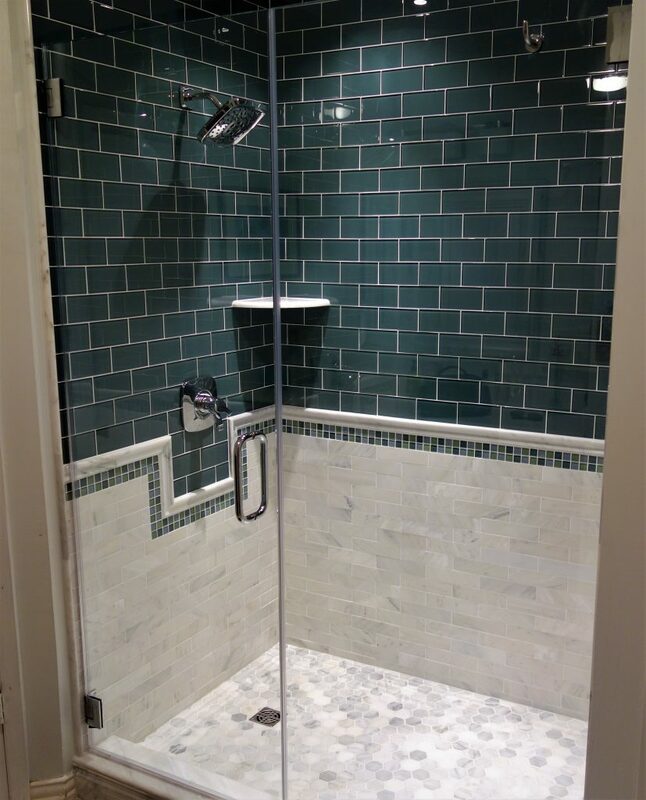 Our TCNA-compliant tile shower and bath installations vary in price from basic to extravagant, and will require additional time and expertise to install versus panel systems. Please see our Q & A section for more information on pricing. In addition to the tub and shower products listed above, we also offer a full range of products to remodel and update the rest of your bathroom. 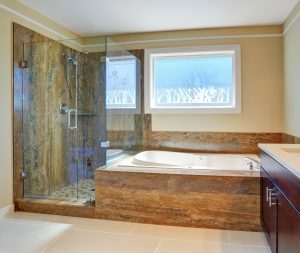 These include acrylic, cast stone, and cast iron tubs; a full selection of shower flooring products and tiles; four different lines of bath vanities, cabinetry, and vanity tops; a full range of fixtures, faucets, and bath accessories; bathroom flooring and accent walls; and even window replacement for bathroom windows. If you own a home or business in the Greater Houston metro area and have a bathroom remodeling project you’d like to tackle, call us today at 832-464-7251. When you call Simplicity, we’ll openly discuss your goals and budget… with no sales pitch or overblown claims. We believe honesty is the best policy and promises made MUST be kept. It’s how we build trust with our customers from the first contact.